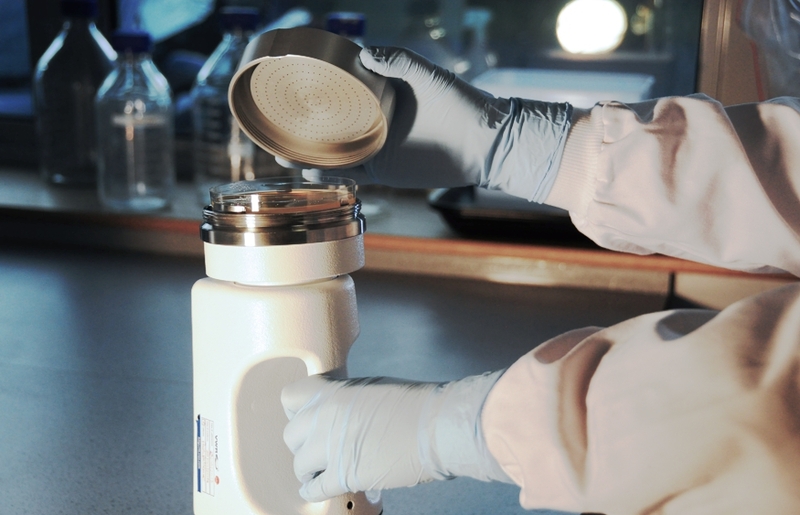 Active (volumetric) air-sampling is an important component of the environmental monitoring of cleanrooms. It is important that the results of such monitoring are accurate. One aspect of ensuring that the result is ‘valid’ is through minimising cross-contamination. The ‘at risk’ part of the sampler is the head. There are three alternatives to control cross-contamination during active air sampling contamination control: using multiple air sampler, autoclaving the sampler head in-between samples, or disinfecting the sampler head intermittently. This paper summarises a study where a disinfectant (70% isopropyl alcohol) was used to disinfect the head of an impaction air sampler between sampling sessions (spray-and-wipe technique). The study examined two factors: disinfectant decontamination effectiveness and the potential for the inhibition of microbial growth. With decontamination effectiveness, successive operations of an air sampler were examined within different cleanroom grades; with microbial growth inhibition studies, different disinfection time points were assessed. The paper concludes that this method of contamination control is effective and applicable to most cleanroom monitoring situations: it is unlikely to allow carry-over of microbial contamination and it is not shown to cause inhibition of microbial growth.